If you’re looking for the best jointer, look no further. We know how frustrating it can be to scour the web for information on these tools just to figure out which one to buy. Fortunately you don’t have to go through the web anymore as we narrowed the field down to the top five. In addition we’ve prepared some buyers’ tips to help you make the right decision. The Delta jointer has a sizable 72 inch cast iron infeed, and the outfeed tables provide support for stocks that are as much as 8 inches wide. Both tables move in a dovetail manner so they’re more accurate and have a longer lifespan. The fence is cast iron and with its 45 degree tilt is suitable for chamfering and beveling. The Delta also comes with a rack and pinion adjustment system so the fence can be adjusted with accuracy. When it comes to power the Delta doesn’t lack either: the 1-1/2 HP motor rotates the cutter head at 5,600 rpm. At this rate you’re getting 16,800 cuts per minute, ensuring the cuts are smooth and clean. The motor is stored in a steel cabinet, and there’s a 4 inch diameter outlet and integrated dust collector for easy setup. Another feature you’ll notice is the cutter head guard pivots out of your way, and the on/off paddle switch is set high on the table so it is within easy reach. When you order the Delta it comes with push blocks, the cutter head, center-mounted fence, dust collector, and other accessories. While the Delta jointer is packed with a lot of features, the manual is thorough and easy to follow. If we’re going to talk about the jointer reviews, the Grizzly 8 inch needs to be discussed as it’s one of top tier jointers available today. Of its many features, the 6 ft. cast-iron bed is one of the most important as it allows for precision jointing, and the hand wheel adjustment works well for outfeed and infeed tables. The Grizzly jointer also has a mobile base fence built in. This center mounted fence is equipped with a pedestal-mounted switch and lateral rack-and-pinion control, and the beds move in a dovetail direction for optimum results. The switch control, which is mounted on a pedestal, is conveniently positioned so it’s within easy reach. As you work it’s inevitable that dust accumulates, but the Grizzly has a dust chute built in as well as a four inch dust port to keep your workspace clean. Bottom line: this is a powerful jointer and is more than capable of handling complex jointer tasks and projects. The Shop Fox W1741 is the one most DIY enthusiasts refer to in discussions of the best benchtop jointer for the money. This is a full featured tool, and the 3 HP powered motor and cutter head knives (four of them) demonstrate its power. In addition the Shop Fox has a parallelogram table adjustment system, a locking mobile base built in and pedestal mounted switch. The Shop Fox also has a center mounted fence (cast iron) and an infeed table. Especially notable here is the fence lock lever handle, making adjustments easy and secure. Once the jointer has been set up the fence can be secured by using the tilt lock: with this you can configure the fence in whatever position as long as it is in range. There’s also a dial indicator that makes it easy to see the cutting angle for making pinpoint 45 or 90 degree cuts, inward or outward. Putting the Shop Fox to work is easy: simply position the fence so you can make the cuts you want and it’s set. You could do a bevel cut at a particular angle in your workpiece’s edge, or you can flatten a stock’s face or create a flat edge for finishing or joinery. The W1741 comes with numerous presets for the most widely used fence stops like 45 degrees outward, 90 degrees and 45 degrees inward. If your project requires a different up, you can adjust the fence stops to suit your requirements. As should be obvious by now, the W1741 is a versatile tool when it comes to beveling, edge jointing, surface jointing and other operations. While the Shop Fox is crammed with features, the table levers simplify the modifications. Powermatic has earned a solid reputation for manufacturing several products that deserve the best tag, and the 60B is one of them. One of the most notable features here is the degree of workspace you get. In addition, the Powermatic is built for cutting hard materials like maple or rough oak, so if you work with this stock you’ll find this useful. The 60B is built from steel and solid cast iron for maximum durability and performance that’s vibration free. 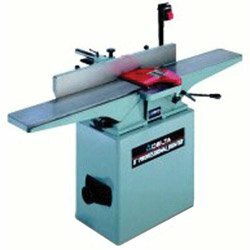 Other notable elements of this jointer are the outfeed and infeed tables; they are fully adjustable, 73 inches long with dovetail mounting for stability. The Powermatic really shows its strength at cutting: the cutter head has three M-2 steel knives that make 21,000 cuts per minute at 7000 RPM, all the while reducing kickback. The jointer also comes with a lengthy infeed table rest which is good for rabbeting. For those occasions when you need to make precise cuts, check the infeed table fine adjustment lever and it’ll do the trick. The 2 HP, 1 PH 230v motor and nonslip V belt work together to produce superior performance, and the switch, motor and drive are all set in a sheet metal stand to prolong their life. As you might expect, the dust collection tool is well-designed and keeps your workspace clean. Overall, the Powermatic jointer delivers the results you’re looking for. Jet is one of those manufacturers known for their quality indoor appliances like portable air conditioners and also power tools, and the Jet JJ-8CS is worthy of being included in a best jointers list. First off, the cast iron bed is quite long (66-1/2 inches long and 9 inches wide) and it has been machined to precision point. A close inspection of jointer shows that it has sizable hand wheels that make it easy to adjust the height of the infeed and outfeed table height. The cast iron fence is well-designed as well and comes with 45 and 90 degree positive stops. Size and power are very evident in the Jet jointer with its heavy cutter head with its three knives, and with the knives and the powerful motor, the results are of the highest quality. The depth scale for the infeed table is easy to read, and the dovetailed table ways makes it easy to make accurate adjustments. A closer look at the table also shows a rabbeting edge is built in for additional flexibility. 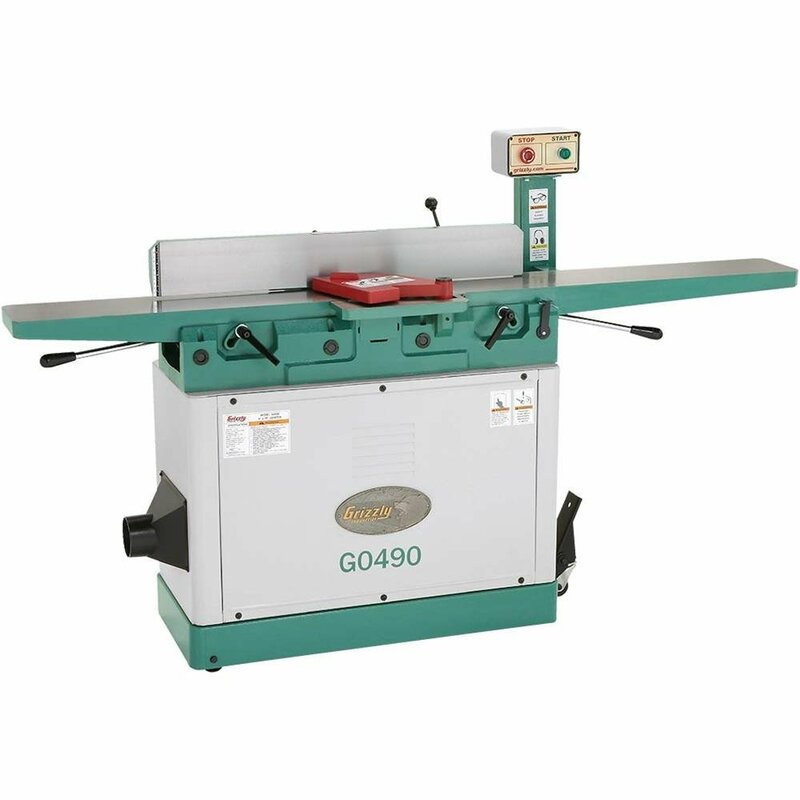 Other notable features on the jointer are its one piece welded stand, safety knife guards for the front and rear, tilting fence and magnetic controls. Overall the Jet jointer is a powerful tool that does not compromise quality with features. If you’re not satisfied with the jointer you’re using now and want more power, the Jet JJ-8CS is worthy of consideration. Benchtop, Open Stand or Closed Stand: jointers come in these three basic designs, and based on our experience, the closed stand design is the best option. Closed stand jointers are great at keeping dust off the unit and thus extend its life. While the open stand and the best benchtop jointers are capable as well, the closed stand does much better overall in terms of performance and reliability. Cutting Depth: the cutting depth determines how many passes are required to straighten out a wood piece. The standard or “normal” cutting depth is 1/2″ to 3/4″. With every pass made, the warping on the wood is removed, the end result being you end up with a straight piece. If you’re just getting started with jointers, keep in mind that each board may require multiple passes to straighten it out. For instance, a jointer with a 5/8 in cutting depth may need more than one pass to remove the warping. Bed Width: the width of the bed is critical as well, but for the most part a width of 6” to 8” will be sufficient for most tasks. There may be other sizes, but the 6 to 8 inch range is more than enough. Adjustable Fence: an adjustable fence with positive stops is absolutely necessary because you must be able to tilt the fence so the jointer remains accurate. Furthermore, some pieces of wood require fence support when the angles are titled. The only way you can work with these types of wood pieces is if your jointer has a fence with positive stops that are adjustable. Horsepower: this one does not need a long explanation. Your jointer needs a sufficient amount of horsepower to carry out its tasks, but fortunately, 1 horsepower is enough to do the job. Even with just 1 HP, a jointer can cut through softwood, hardwood and other types of wood with no trouble at all. Dust Collection: just like any other woodworking tool, a jointer generates dust and debris when used, so a dust chute or other mechanism must be built in. No matter what jointer you buy, a system for collecting dust is necessary. Dust collecting is important not just for health reasons, but also to keep the shavings and debris off your jointer and prevent damage. Warranty: how long is the warranty? What does it cover? Don’t neglect this aspect because in the event something untoward happens (i.e. the jointer has a defect), you’ll need the warranty. Deciding what the best jointer is never going to be easy as we all have personal preferences and requirements: some may need powerful jointers while others may require a simpler, more basic tool. With the tips and reviews here however, your job should be a lot easier. Good luck!